(CNN) -- Ricky Hatton heads into his light-welterweight super-fight against Manny Pacquiao with his trainer Floyd Mayweather Sr admitting that there have been "problems" in their camp. 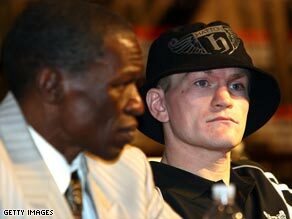 Mayweather Sr. and Hatton have admitted to tensions in their relationship. Hatton has been unhappy with Mayweather's punctuality for training sessions, but the American tried to play down the issue ahead of Saturday night's clash in Las Vegas. "It doesn't mean a camp is not a good camp because there are problems," Mayweather Sr told Press Association. "I think he had a good camp and was there a problem there? Yes. "It was a problem that could be addressed and taken care of without being in the media. Mayweather's son ended the British fighter's unbeaten record in another 'super-fight' showdown in Vegas in December 2007. That bout with Floyd Mayweather Jr. was at welterweight, with Hatton dropping down to his best weight for the clash with Filipino hero Pacquiao. Mayweather's father took charge of Hatton's training ahead of his last fight against Paulie Malignaggi where he scored a convincing victory. He has been credited with helping Hatton adapt his style and also making changes to his diet between fights. Hatton's undefeated record at light-welterweight will come under threat from southpaw Pacquiao (48-3-2) who is bidding to become a global champion in a sixth different weight class. Pacquiao sent Oscar de la Hoya into retirement with a stoppage victory in his previous fight and has been installed as a narrow favorite. The 30-year-old is a national hero in the Philippines with massive interest in all his fights. He is expected to take home $12 million from the bout with Hatton getting $8million. The worldwide pay per view revenues are predicted to be at least $40 million to watch two all-action fighters with solid chins. "Ricky Hatton is a different fighter from what I have fought before," said Pacquiao. "I expect him to be fast and strong. It's going to be a hard fight," he told a pre-fight press conference. Hatton will be supported by his usual massive contingent of British fight fans who have flooded Vegas as they did for the Mayweather Jr. adn Malignaggi showdowns.